Parrot, the general name of the psittacidce, a family of scansorial birds, remarkable for the elegance of their form, the brilliancy of their plumage, and their docility and power of imitating the human voice. They have a large strong bill, much arched, with acute tip, and the lower mandible notched at the end; the upper mandible is movably articulated to the frontal bones, enabling them to seize larger objects than other birds of their size; the tongue is thick and fleshy, the wings and tail generally long, tarsi short and robust, and the strong toes directed two before and two behind, the former united at the base by a narrow membrane. These are the typical climbers, but are slow and generally awkward on the ground; they use both bill and claws in climbing, and while feeding use one foot to hold their food; though rather sedentary, most of them are good fliers; the neck is short, and has usually 12 vertebrae; the sternum is long and narrow, with generally an oval aperture on its inferior margin on each side; the structure of the tongue and the complicated lower larynx enable them to articulate with great distinctness. They are confined to the warm parts of America, Asia, Africa, and Australia, and generally to the southern hemisphere; their food consists of soft pulpy fruits, especially such as have hard kernels or seeds; they are usually seen in large flocks, active in the morning and evening, noisy and quarrelsome, destructive, to vegetation in their wild state, and very mischievous in captivity; they are monogamous, and build their nests generally in hollow trees. This is a very extensive family, numbering about 300 species, and divided by Gray into the subfamilies of pezoporinw, araince, lorince, cacatuince, and psittacince; the first four are described respectively under the titles Paroquet, Macaw, Lory, and Cockatoo, leaving for this article only the psittacinm, and the genus conurus of the macaws. Some of the parrots present raptorial characters in the form of the bill, and especially in its soft skin or cere. Bonaparte makes of them a distinct order, placing them at the head of his system, separated from the typical scansores by the rapacious birds; for the connecting links between the families see Owl and Owl Paeeot. 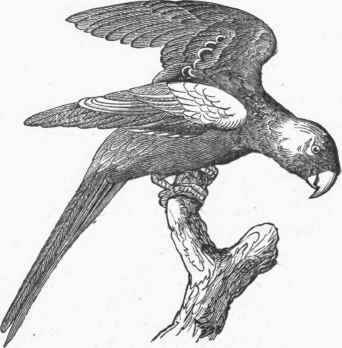 - The only well ascertained species within the United States is the Carolina parrot (conurus Carolinensis, Kuhl); in this the length is about 14 in., and the alar extent 22; the bill is short, bulging, and very strong; the head is large, the neck robust, and the body and tail elongated, the latter wedge-shaped; the bill is white and the iris hazel; general color green with bluish reflections, lightest below; fore part of head and cheeks bright red, extending over and behind the eye, the rest of the head and neck gamboge yellow; edge of wing yellow tinged with red; wings and their coverts varied with bluish green, greenish yellow, and brownish red; two middle tail feathers deep green, the others with the inner webs brownish red; thighs yellow. This species has been seen as far north as Lake Ontario, though now it is chiefly confined to the southern and southwestern states, and as far as the Missouri to the west. They are very fond of the seeds of the cockle burr, and eat almost any kind of fruit and grain, from their immense flocks committing great havoc in the garden, field, and orchard, destroying in search of seeds far more than they consume; they are killed in large numbers by the farmers, who consider their flesh a delicacy. The flight is rapid and direct, with great inclinations of the body and incessant noisy cries; they generally alight close together on the trees bearing the desired fruit; they are savage when wounded, but are easily tamed by immersion in water; they are destructive in captivity, and incapable of articulating words. They are fond of sand and saline earths. Many deposit their eggs in the same hollow of a tree, each laying two or three. Several other parrots are found in Mexico and Central America. - To the subfamily of psittacince belong the parrots best known in the domesticated condition, especially the gray and green parrots so common as pets; in this group the head is without crest, the margins of the bill are dentated or festooned, the wings pointed, and the tail short and square. In the old genus psittacus (Linn.) the bill is large, rather compressed, with biangular cul-men much arched to the tip, near which the lateral margin is deeply notched, the under mandible much sinuated and the anterior edge sharp; wings generally reaching to the end of the tail, with second and third quills equal and longest. More than 40 species are found in the humid forests of Africa and South America; collecting at night in immense flocks, they leave their roosting places early in search of food, which consists chiefly of pulpy fruits and seeds, after which they bathe and retire to thick-leaved trees during the heat of the day, going in search of food again at night; they migrate in large flocks to warmer regions on the approach of the rainy season, rising to a great height and uttering the most discordant screams; the young are fed with the disgorged half masticated food of the parents. 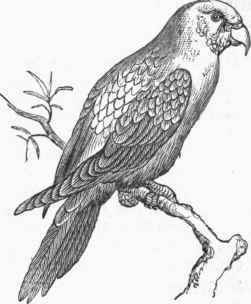 The gray parrot (P. erythacus, Linn.) is the most remarkable for its docility and power of articulation; it is about 12 in. long, of an ash-gray color, with a bright scarlet tail, yellowish white irides, and grayish feet and toes. It is a native of W. Africa, whence it has been imported from a very early period; in captivity it feeds on bread and milk, nuts, and even meat, holding its food with one foot, and reducing it to small pieces by the bill and cutters on the palate; it may reach the age of 70 and even 90 years. It breeds readily in captivity. - In the genus chrysotis (Swains. ), of tropical South America, the bill is smaller but strongly dentated; the wings reach to the middle of the tail, which is broad and rounded. The green parrot (C. Amaeonicus, Gmel.) is very often taken to the United States and Europe on account of its great colloquial powers; it is 12 in. long, the bill orange yellow, as well as the cheeks and chin; the general color is, shining green, with a bluish purple band over the forehead, and the feathers of the hind neck edged with black; it inhabits the country watered by the Amazon, where it often does great mischief to the plantations. The festive parrot (C. festi-vus, Swains. ), a native of the same forests, is 15 to 16 in. long, of a general green color, with a narrow red frontal band and eye streak, blue above and behind the eyes, lower back and rump vermilion, and the greater quills with blue outer webs and the inner greenish black; it is docile, easily tamed, and learns readily to pronounce words and sentences. The last two species are those most commonly brought from South America; several others are described. In the genus psittacula (Briss.) the size is generally small; the bill is rather large with the lateral margins festooned; the pointed wings extend to the end of the tail, which is short and even; about 30 species are described in South America, Africa, and Asia and its archipelago; they are rapid fliers and expert climbers, often hanging head downward in their search for fruits; while feeding they utter a shrill chirp, like that of a large grasshopper; when sleeping they generally suspend themselves by one or both feet, head downward. Here belong the beautiful little "love birds," the genus agapornis of Selby. Swin-dern's love bird (P. Swindereniana, Kuhl) is a native of S. Africa; it is about 6 in. long, with a black strong bill whose upper mandible is notched; the head and nape are bright green, bounded by a black nuchal collar; neck and breast yellowish green, mantle and wings green, lower back and upper tail coverts azure blue; the short and nearly even tail has a median bar of vermilion edged with black and the tip green. These parrots are remarkable for their attachment to each other.